Cathedral Director of Music, James Thomas will perform Messiaen’s La Nativité du Seigneur on Sunday 10 January 2016 at St Edmundsbury Cathedral, Bury St Edmunds. The recital starts at 5 pm and is free of charge with a retiring collection. All welcome. La Nativité du Seigneur is Olivier Messiaen’s great cycle of music celebrating the birth of Christ and is performed annually at the Cathedral by James Thomas. A full music programme for the coming year will be launched shortly including the annual Organ Festival, celebrating its 5th anniversary this year. The programme also includes concerts and lunchtime recitals. 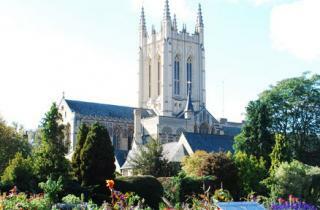 Full details of services and events at St Edmundsbury Cathedral can be found on the website here.